Your roofing budget may influence the type of new roof your home receives, but the static cost of the roof and its installation shouldn't be the only factors you consider. Not only may you consider whether to completely replace the roof, repair it or recover it, you may also look at characteristics like the expected lifespan of the roofing material and the upkeep required. Sometimes the decision to install a new roof is a no-brainer. Multiple leaks, missing shingles, and patches of damage may suggest that retiring your roof is the right choice. At a certain point, age interferes with your ability to maintain the roof and replacement is your only solution. Additionally, if you're looking to sell your home in the next five years or so, a new roof may be a significant selling point. Before buyers see the newly renovated kitchen or the updated bathroom, they'll be greeted with a gorgeous new roof. A new roof gives you massive curb appeal. However, if you're planning to stay in your home for several years, you'll still need to make a decision on whether to get a new roof. The experts at Bob Vila's site offer some creative ideas to help you avoid installing a completely new roof. If the damage is more significant but confined to one side of the roof, partial reroofing is an option that will cost thousands of dollars less than doing the entire roof. Replacing shingles due to wind damage or a fallen limb is a relatively easy and inexpensive. Torn or damaged shingles can be removed, and new ones can be slipped in place. Tip: If you've decided upon partial reroofing or repair of a large patch on the roof, make sure to consult with your roofing contractor to get shingles that match as closely as possible to your existing roof. If the damage or age of your roof requires a completely new installation, you'll need to choose the new roofing material and will also need to make a few other vital decisions. 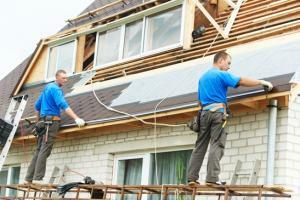 For example, your roof replacement may proceed in one of two ways. The crew might apply a new roof on top of the old one, or they may remove the old roof completely before placing a new one on the home. Sometimes, local building codes require that the present roofing material is removed before a new roof may be applied. These rules are in place because a roof with too many layers may impact the structural integrity of the house. Consider that placing a new roof on top of an existing layer is equivalent to parking a Suburban on the top of your house. Whether you've opted for a completely new roof or whether you've had part of it repaired, you'll want to make a list of maintenance projects that will extend the lifespan of your roof. In addition to the yearly inspection of your roof (which is the best way to catch small issues before they become catastrophic problems), you'll want to keep your gutters clear and clean. Also, you'll want to guard against algae growth, which may result in black streaks that flow across the roof and cause damage to the shingles. Using a protective coating should reduce the growth of algae, but you may also want to consider getting the roof washed to remove buildup of dirt and debris.